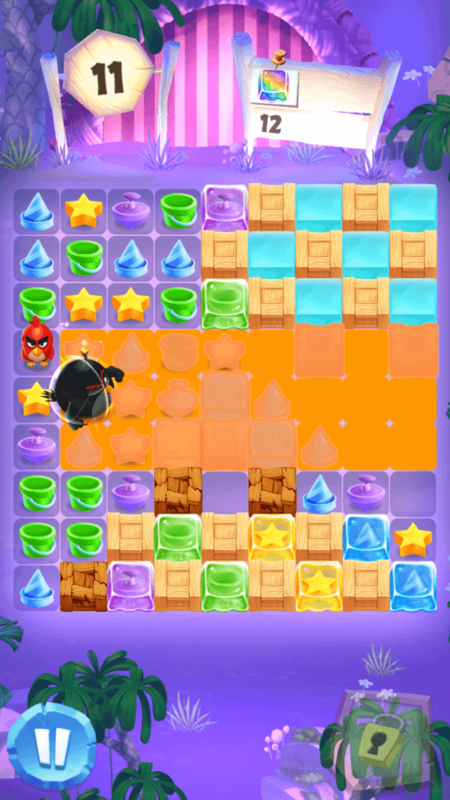 Angry Birds Match is the most adorable game you will ever play. Those baby birdies are cute AF! While gameplay is very similar to other match-3 puzzlers, it’s those hatchlings that will compel you to play non-stop for hours. Complete puzzle levels to collect hatchlings, place them on cool locations such as the beach, surprise party, carnival and the Wild West and equip outfits to them to make them look cuter. There are over 50 charming hatchlings to collect and each has its own unique style. Our favorite Red Bird appears when you match 4 objects of the same type. We can use him to clear objects in any direction we want. Just drag him left, right up or down and lift your finger up to release him. If you drag him towards the left, he will move left, if you drag him up, he will move up. However, you should launch him in the correct direction keeping your objectives in mind. So if the goal is to collect an “X” number of cakes, get rid of pigs or remove mud, just look around and launch the bird in the direction where there are more cakes, pigs or mud. 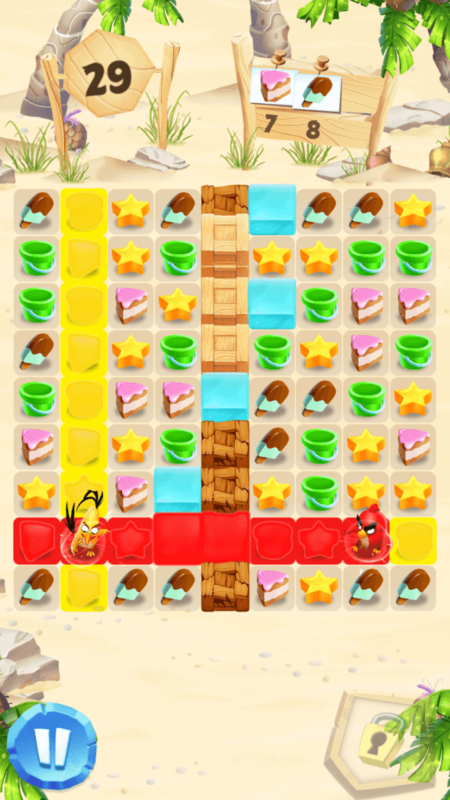 Example: If there is more number of cakes on your right, just launch him towards that direction to collect cakes. If there are two pigs up above him (on the same column) and one pig below him, then launch him up to remove those two pigs. Bomb bird appears when you match 5 objects of the same type. He can be very useful in removing a chunk of obstacles, getting rid of a multiple pigs from the game board and collecting plenty of cakes and other objects required to complete an objective. You can apply the same strategy explained in point no. 2 to your Bomb bird, but before releasing him, check how many columns or rows he will cover when he explodes and moves. All you have to do is press and hold the bird and drag to the desired direction. You will see columns/rows highlighted in yellow. Normally the black bird covers three columns or rows, so any object on those columns/rows will be cleared when he moves over them. You may use the bomb when the right time comes. Use him when you spot multiple pigs, ice blocks or mud that come under his range. You will receive a free chest containing unlimited lives once you select an outfit for Jim, the blue hatchling. Jim can be unlocked when you reach level 2. Unlimited lives will be available only for one hour, so don’t waste any time and keep playing the game for one full hour to unlock as many hatchlings as you can. Since no hearts will be deducted if you fail to finish a level, you can stop worrying about losing lives for an hour. Try completing a level with plenty of moves remaining to get bonus coins. Gems are premium currency, but there are a few ways to get them for free. You might get gems when you choose an outfit for an unlocked hatchling. Selecting a free outfit allows you to open a basic chest which may contain coins, gems or lives. You are lucky if you get gems. Save them for premium chests. Premium chests may contain a brand new outfit for your hatchlings. You can just tap a hatchling and then tap “Chest” that appears below a cool new outfit to get it. Spend 20 gems to open a premium chest. Also, earn gems when you connect the game with your Facebook account. If you want to clear an entire row and column at once, then you should try bringing Chuck to the game board. All you have to do is drag and release chuck and he will clear them in no time. 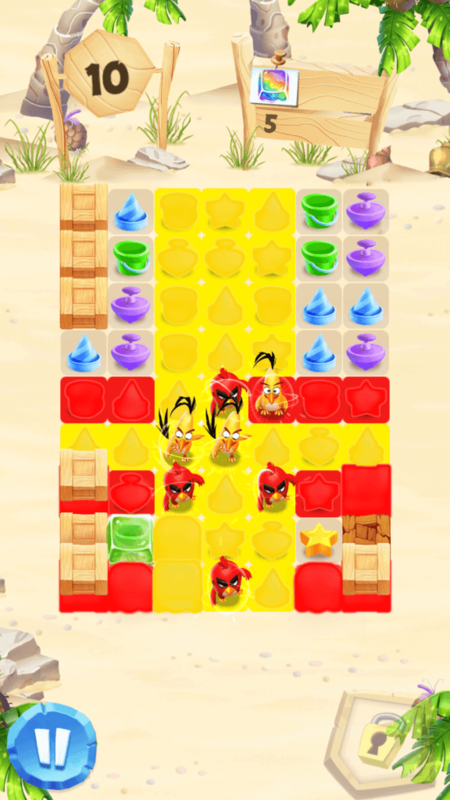 To make the yellow bird appear on the game board, just make a cross-shaped or an L-shaped match. All objects in an L-shape should be of the same type. Chuck can be useful to clear all obstacles such as mud and glass, however you can’t move him to the next row or column. The yellow birdie can only clear that row/column where he appears. So if he appears on row 5, column 5, then he will clear them. You can bring him one row down or to the next column by matching objects close to him. If you spot two birds placed next to each other or appear on the same row or column, then don’t hesitate to launch a bird at the other. It will set off a nice combo, clearing more rows and columns all at once. The below screenshot shows the havoc these birds will create if I launch at least one bird at the other. And because these birds are placed close to each other, launching one bird at the other will trigger a chain of combos. To identify a combo chain, just drag your finger towards another bird who is linked to the first bird (don’t lift your finger). You will see all columns/rows highlighted in yellow, indicating that these will be cleared once you launch him. If the third bird is also close to the second bird or is in the in the same row or column, then the second bird will be launched at him/her triggering another combo. This way you will be clearing more rows and columns at once and complete objectives faster.